When I mentioned in my last post about experimenting with a low carb routine , I received many lovely comments from friends and readers about this bold step into the uncertain land :). Diet of any form is exceedingly difficult to stick to, because, inherently, it is a restraining order and all you want to do is break free! But, I find that the urge to cut loose sedates with time and it becomes easier to accept and adapt. I know all this sounds philosophical but when food is life, well, the lines tend to merge more often than not. Anyway, what I meant to say was that life without pasta seems a bit easier now, than it did 20 days ago, when I first thought up my experiment. So, I make simple meals that are roti friendly and yet indulgent enough to make up for the "compromise". One such that is Paneer Makhanwala. Still, it is anything but a heavy dish, especially when made at home. It has the right balance of special and light making it great for a weeknight dinner or for company. 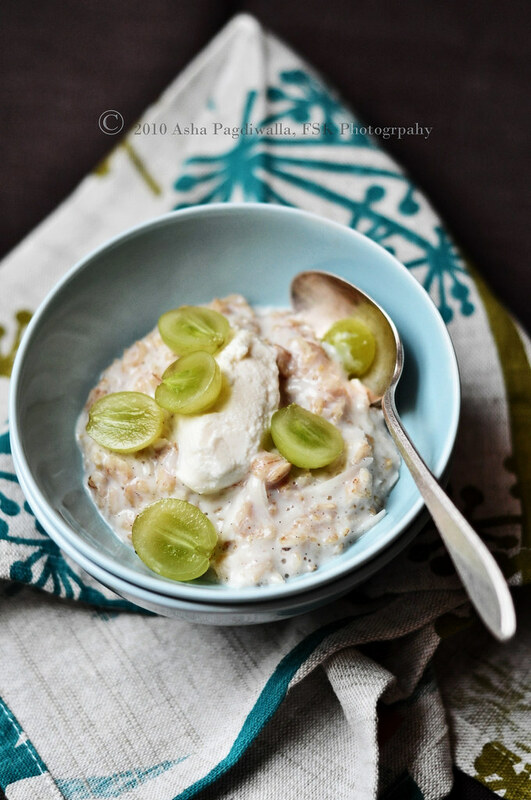 To finish, I served this easy Oat Pudding flavored with Vanilla and Coconut enhanced by a cannelle of honeyed ricotta and a dressing of green grapes. It started with a sudden craving for warm oatmeal but one that hit too late for breakfast and too close to lunch. So, I decided to make it simply dessert, not too sweet and quite heart healthy too! Bring the oats, milk and coconut to a boil. Add the sugar and salt and cook on medium low, stirring occasionally, until the oats are cooked and the mixture is of pudding consistency, about 10-15 minutes. Off the heat, stir in the vanilla. Divide into two bowls. 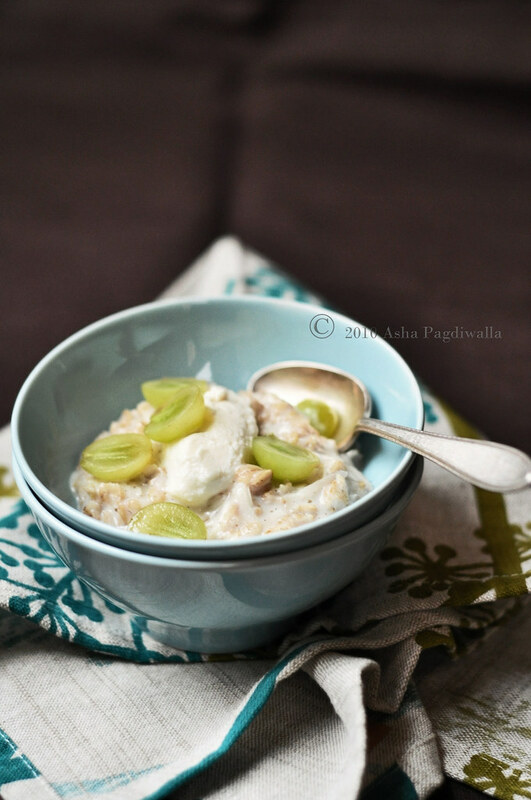 Whip the ricotta and honey to a smooth mixture and add a cannelle of it to each bowl. Sprinkle fresh fruit and serve. Dry roast the whole spices and set aside in the processor. In a little butter, saute the onions, garlic, ginger and tomato until soft. Set aside for a few minutes to cool. Add to the processor and grind to a smooth puree with the spices. Heat 2 tablespoons of butter with 2 tablespoons of oil. Return the ground mixture to the pan and roast for a few minutes until the oil separates from the mixture. Add the ground turmeric and chilli powder if using and salt to taste. Add tomato paste and roast for a few minutes. Add water and bring to a boil. Lower the heat to a simmer and cover. In a pan, saute the paneer cubes in ghee to brown and crisp all sides. 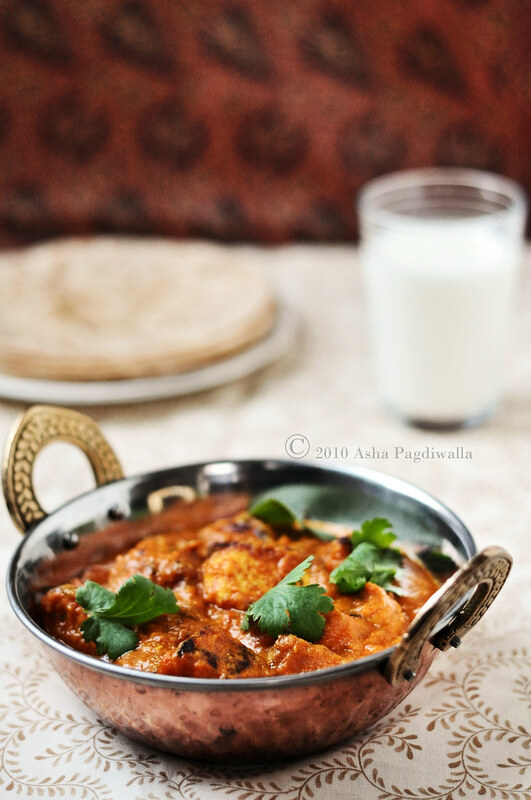 When the paneer is ready, add the milk and remaining butter to the curry. 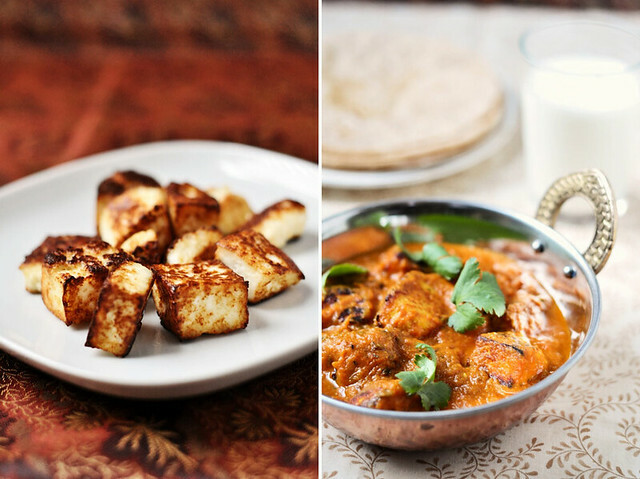 Gently lay the paneer into the simmering mixture, cover and bring to a boil. Lower the heat and cook for 5 -10 minutes. Gently stir in the dried fenugreek taking care to not break the cheese cubes. 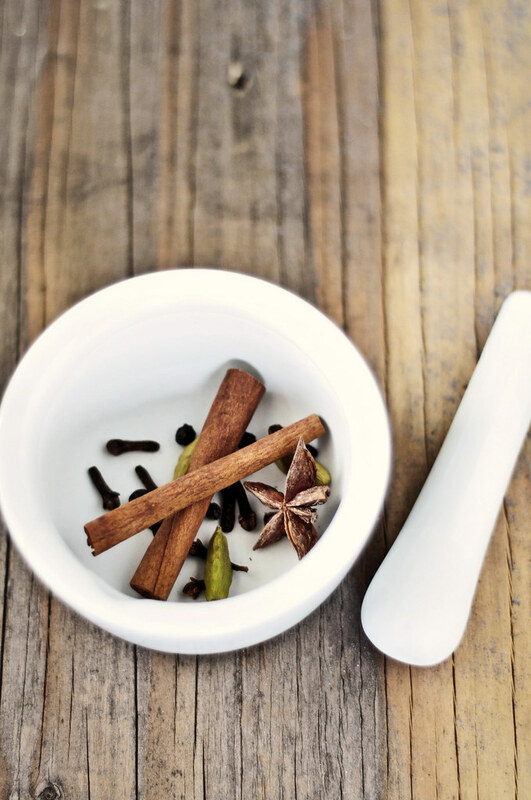 Garnish with cilantro and serve with fresh rotis.